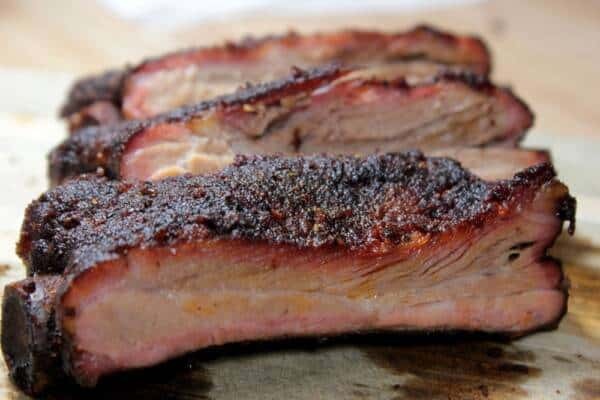 Smoked spare ribs injected with butter mixed with my original rib rub (purchase recipes here) and cooked 4-1-1 style (explained below) are just what the doctor ordered and they are a nice way to do ribs just a little different. 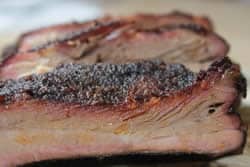 In this wonderful smoked spare rib recipe, the rub gets injected into the meat and rubbed onto the outside. Prepare to be amazed! I found these ribs already trimmed and membrane removed and they were at a great price. 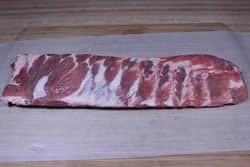 If you have regular spare ribs, you will need to remove the membrane and trim off the bone on leading edge so that you are only left with actual ribs. Brush some oil onto each side of the ribs to help the rub to stick. I often use mustard, honey, and an assortment of other things as well to serve this purpose. 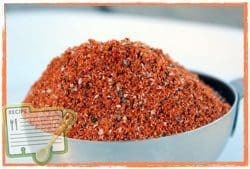 Then apply Jeff's original rub (purchase recipes here) to the ribs generously. Wait until it has that “wet” look, flip the ribs over and apply oil and rub to the meaty side. 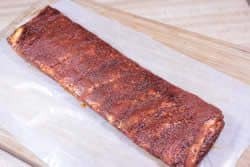 Once both sides are oiled and rubbed with Jeff's original rub (purchase recipes here), the ribs will be wrapped in plastic wrap and allowed to marinate for 8-10 hours in the fridge. I usually do this right before bedtime so they can marinate all night. The next morning, pull the ribs out of the fridge and remove the plastic. I usually make the butter injection right before I pull the ribs out of the fridge. 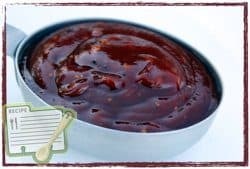 To make the injection you will probably want to run about a cup of my original rub (purchase recipes here) through the coffee grinder to powder it. This helps it to not get stuck in the small holes in the injector. These coffee grinders are cheap on amazon.com and you might even be able to find them locally. If you have a good blender or food processor, it might also work ok for this. 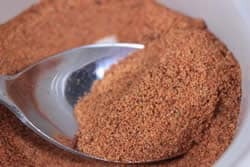 As a powder, my rub becomes an entirely different and delicious product that will not only work great for injections but it becomes even more useable as a seasoning for lots of other things.. let your imagination soar! 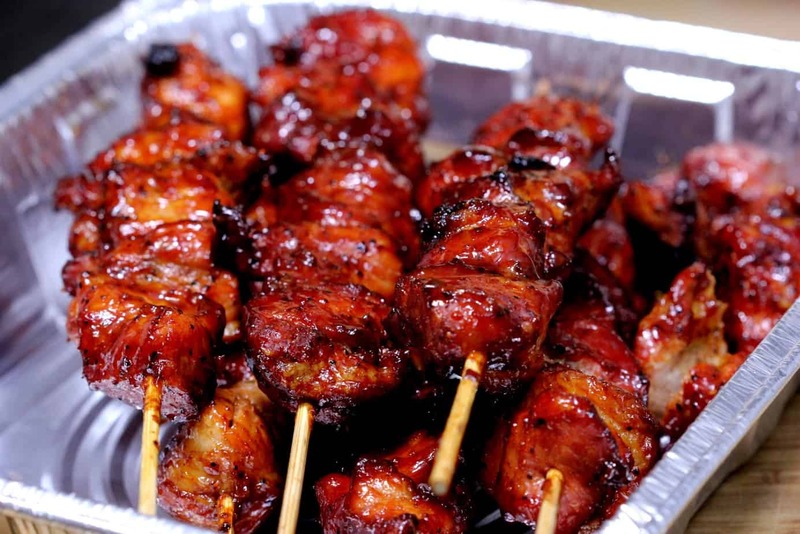 Mix a heaping tablespoon of the powdered rub into a stick (¼ lb) of melted butter and mix thoroughly. Lay the marinated ribs on a piece of plastic wrap then cover the ribs with a piece of plastic wrap. This prevents the butter from becoming a geyser that can shoot across the kitchen suddenly. The plastic is not required but don't say I didn't warn you! Fill the injector with hot melted spicy butter and push the needle into the meat between each bone so that the tip is about 1 inch into the meat. Depress the plunger as you move the needle left and right at different angles to ensure that the butter is getting in there real good. Slowly pull it out as you continue to depress the plunger. My general goal is to keep injecting butter until I see it seeping out somewhere. Once I am done with one side, I flip the ribs around and do the same on the opposite edge at about 1 inch into the meat. If you need more butter, make another batch so you don't have to scrimp on it. Give it all it will take! You can expect some of it to come out but more stays in than what comes out and it does seem to make a big difference in the end product in my opinion. You will notice after injecting that you have all of this butter on top of the ribs. Spread the butter all over the top of the ribs and sprinkle on a little more of my original rub. 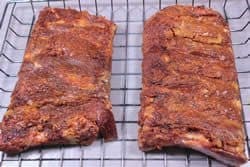 My rub is not overly salty and complements the ribs really well so you can feel free to use a lot of it if you want to. 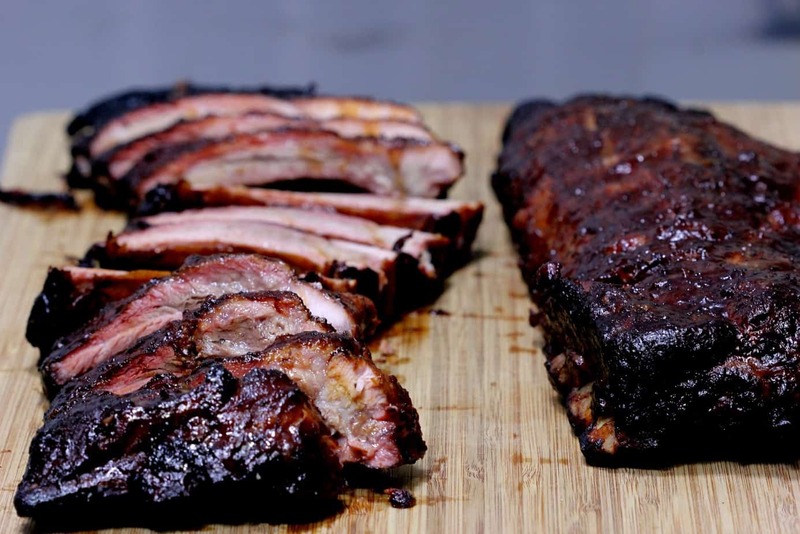 You can use any kind of smoker you have access to in order to smoke these injected ribs. I used my propane smoker for these with the large iron woodbox full of pecan chunks. I was out of pecan after the first couple of hours so I started up my Stihl chain saw and cut a log into pieces that were about the same size as my chip box. 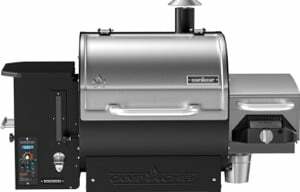 This Great Outdoors Smoky Mountain propane smoker by Landmann is the next best thing to a real wood smoker in my opinion when you are simply judging on flavor. I get the best flavor out of that thing and it always amazes me. Anyway, whatever smoker you have needs to be pre-heated to between 225 and 240°F and make sure you have at least 3-4 hours of smoking wood available. I humbly recommend pecan if you have it available. 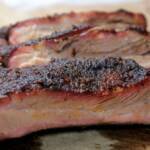 Cherry, apple, hickory and even mesquite are also great choices or a mixture of these in any ratio works great. I wanted to use a Bradley rack (I love those things in case you haven't noticed) so I cut the rack of spare ribs in half as you'll notice above. This makes them very easy to maneuver, flip over, wrap, etc. Make sure the rack of ribs on the Bradley rack are bone side down. Place the ribs or Bradley rack of ribs on the smoker grate and let the smoking begin! I usually tout the 3-2-1 method as a great way to smoke ribs if you like them to be really tender. This is against competition rules but then, I don't like competition ribs all that much. I like them to be pretty darn tender but not quite falling off the bone. I usually tend to do something closer to a 4-1-1 method to get them tender but not overly tender. Well, I'm going to explain it in the next section so don't get your knickers in a knot! Place the ribs on the smoker bone side down, as mentioned above, and let them smoke their little porky hearts out for about 4 hours at 225°F . 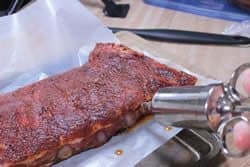 Wrap the ribs in a double layer of heavy duty foil, not real tight but tight enough so they can steam real nice inside and find their tender side. I was using the Bradley rack so I just wrapped the entire rack in extra wide, heavy duty foil and it worked like a charm. That is not my normal procedure but I decided to try it and it worked just fine. You can also just wrap the ribs with foil but I do recommend a double layer. I placed the wrapped Bradley rack back into the smoker for 1 hour at the same exact temperature. 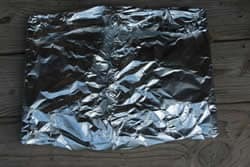 After the ribs have tenderized for 1 hour, remove the foil and place the ribs back into the smoker, just like in step one, for one additional hour. 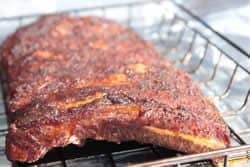 This additional hour, resets the crust, brings a little more color to the outside of the ribs and can even give them an extra bit of smoke should you choose to add smoke during this time. When the ribs are finished, bring them in, let them rest for about 10 minutes then slice them up. I recommend placing them bone side up to slice since that allows you to see the direction of the bones making it easy to slice between them. If you are a garlic lover, add some roasted garlic paste to the butter. Just cut the top ¼ inch or so off of a garlic bulb (no need to peel). Drizzle a little oil onto the cut top of the bulb and place it in the smoker right on the grate for about 1.5 hours or until the garlic is so soft you can squeeze it out like toothpaste. 1 bulb to a stick of butter is about right! 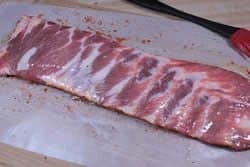 I'm not much of a meat mopper but if you are so inclined, it never hurts to spray a little apple juice on the ribs about every 30 to 45 minutes while they are unwrapped. Do it quickly to minimize heat loss. 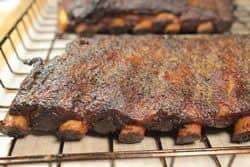 If you like the spare ribs to have a fair amount of tug to them then you might consider just leaving them in the smoker, no wrapping, until they are as tender as you like them. This usually takes about 6-7 hours. It is perfectly acceptable to use a vertical rib rack if you have limited space and need to cook a lot of ribs. Make a bunch of these up ahead of time skipping the last 1 hour step in the 4-1-1 or the 3-2-1 and take them tailgating still wrapped in foil! 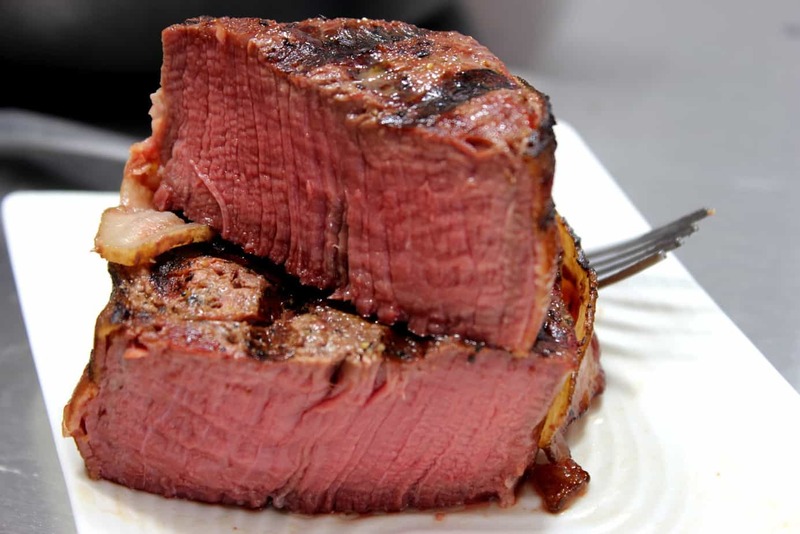 Heat them over indirect heat on the grill until they are slightly warm then unwrap and finish right on the grill grate (still indirect heat) until they are as warm as you like them. Sauce as desired. Smoked spare ribs injected with butter mixed with my original rib rub and cooked 4-1-1 style are just what the doctor ordered and they are a nice way to do ribs just a little different. 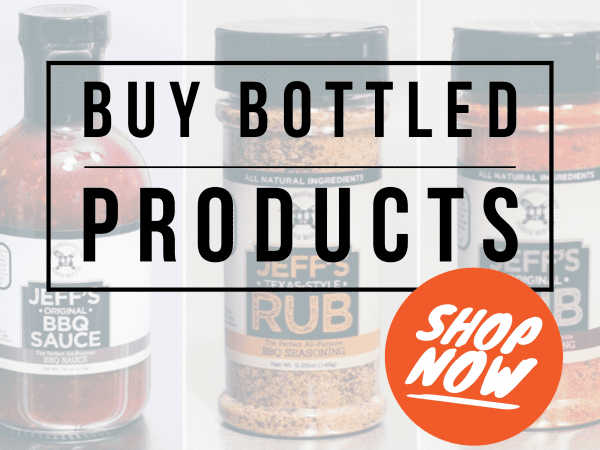 Apply Jeff’s rub (purchase recipes here) to the ribs generously. 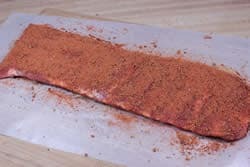 Once both sides are oiled and rubbed with Jeff’s rub, my original naked rib rub recipe, wrap the ribs in plastic wrap and allow to marinate for 8-10 hours in the fridge. Make the butter injection right before you pull the ribs out of the fridge. Run about a cup of my rub through the coffee grinder to powder it. This helps it to not get stuck in the small holes in the injector. Lay the marinated ribs on a piece of plastic wrap then cover the ribs with a piece of plastic wrap. This prevents the butter from becoming a geyser that can shoot across the kitchen suddenly. Fill the injector with hot melted spicy butter and push the needle into the meat between each bone so that the tip is about 1 inch into the meat. Depress the plunger as you move the needle left and right at different angles to ensure that the butter is getting in there real good. Slowly pull it out as you continue to depress the plunger. Keep injecting butter until you see it seeping out somewhere. Flip the ribs around and do the same on the opposite edge at about 1 inch into the meat. If you need more butter, make another batch so you don’t have to scrimp on it. Give it all it will take! Spread the butter that seeped out all over the top of the ribs and sprinkle on a little more of my rub. 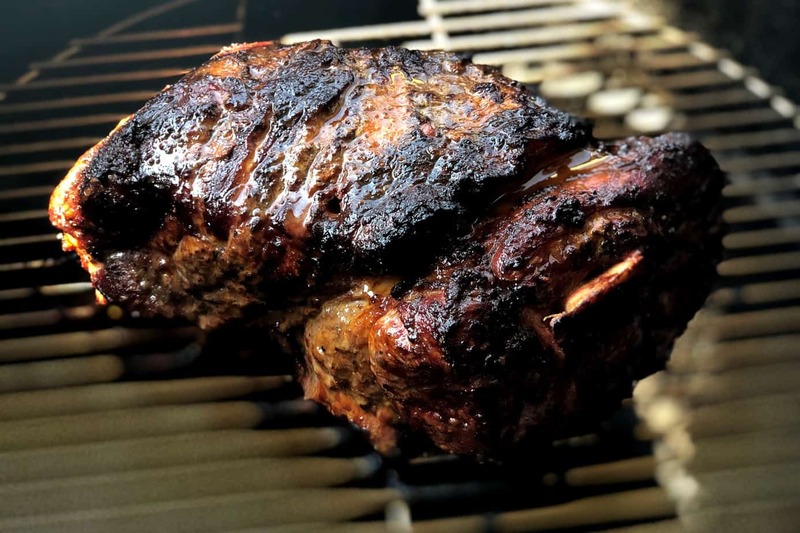 Pre-heat your smoker to between 225 and 240°F and make sure you have at least 3-4 hours of smoking wood available. I wanted to use a Bradley rack (I love those things in case you haven’t noticed) so I cut the rack of spare ribs in half as you’ll notice above. This makes them very easy to maneuver, flip over, wrap, etc. Place the ribs on the smoker grate bone side down and let the smoking begin! Place the ribs on the smoker bone side down, as mentioned above, and let them smoke their little porky hearts out for about 4 hours at 225°F. Place the wrapped ribs back into the smoker for 1 hour at the same exact temperature. 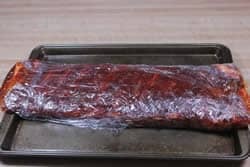 After the ribs have tenderized for 1 hour, remove the foil and place the ribs back into the smoker, just like in step one, for one additional hour. 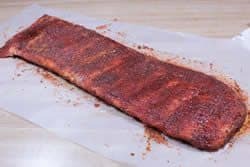 This additional hour, resets the crust, brings a little more color to the outside of the ribs and can even give them an extra bit of smoke should you choose to add smoke during this time. I have a very basic question. When I first started smoking, I thought you would keep putting wood on for the entire time. When I did that, my wife said the meat tasted like WOOD. It was overly smoked. When you say smoke them for 4 hours, HOW LONG DO I KEEP PUTTING IN THE WOOD?? That’s my biggest problem.. I don’t know what’s best..
Daniel – that’s a common mistake with beginners. Rule of thumb is you want to smoke until about 130°F internal temperature. 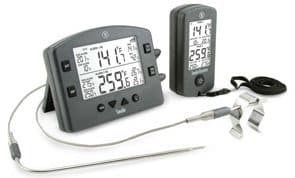 After that temp, the meat proteins will no longer absorb smoke flavor and all you’re doing is building creosote on the outside. Another common mistake is creating a huge billowing cloud of smoke. What you’re looking for is a thin, wispy, grey smoke. You’re adding the smoke for flavor, not cooking with it. Depending on your smoker and what you’re cooking start with 2 or 3 chunks of wood at the beginning and then if you need more for longer cooks, add 1 or 2 chunks at a time. Sounds to me like maybe you had both issues going on. Don’t worry though. We’ve all been there! Have fun & smoke on! Thank you for your feedback. I am using an electric smoker, so I put in the wood chips on the side. 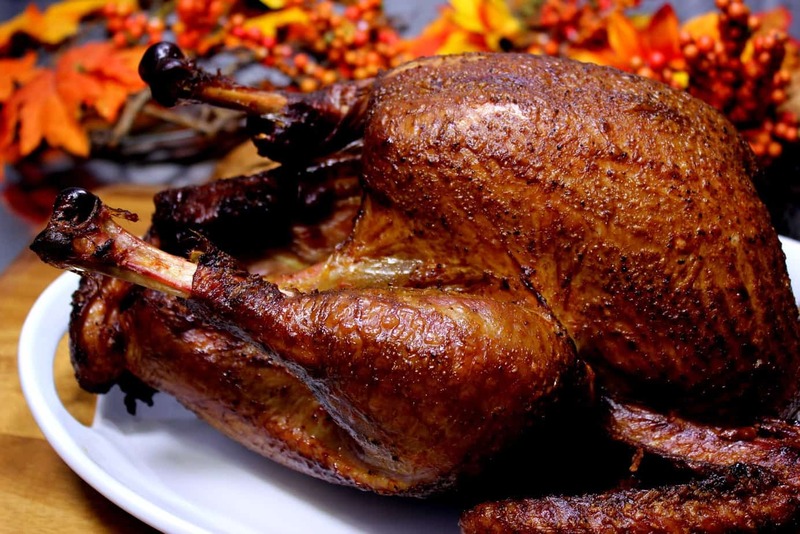 To be clear, are you suggesting I put in one load only and that would be sufficient for the smoking flavor, but let it stay in the smoker to continue cooking for the four hours or more..
Daniel – Essentially….yes. Again, you want to smoke until the internal temp of the meat is 130F. Of course that’s hard (but not impossible) to measure on ribs. 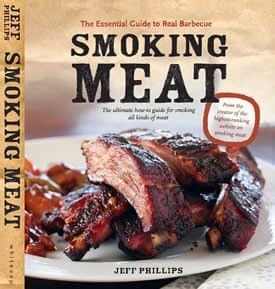 For the rib recipe above using the 4-1-1, I’d probably smoke for the 1st 3 hours or so. After that, you’re smoker is acting essentially as an oven. Like most of us that have been cooking ribs etc. for some time; we are always looking for a new way to make them better. Well I made these for Super Bowl Sunday. My family couldn’t get enough of them. Best flavor and tenderness that I have ever plated. Also did the smoked meatballs. Excellent flavor; but I forgot that some cant take the habaneros. Caution on that note. My only negative on the cheese stuffed meatballs is the cheese melted all inside my smoker… lots of cleanup not expected, should have put extra pan under. Meantime enjoyed both on the table Fabulous! thank you! Jeff, your recipes are fantastic! I have passed them on to my family and friends, I hope they have made good use of them! Good things should not be hoarded, but shared! I have a request: Please include your Notes/Comments in your printable Version of the recipe also, if you would please! I copy and save your recipes until I need them, and it’s much easier to have all info there, and not have to keep going back thru the main recipe to find your Notes/Comments. 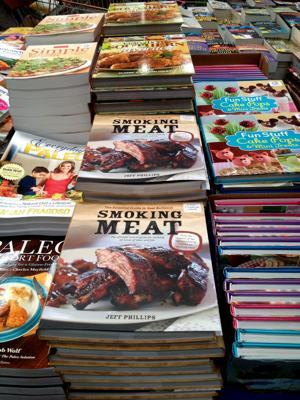 Jeff, I have been faithfully reading your methods and recipes for a long time now. I have particularly been working on spare ribs. I have concentrated on the original recipe 1-2-3 method. 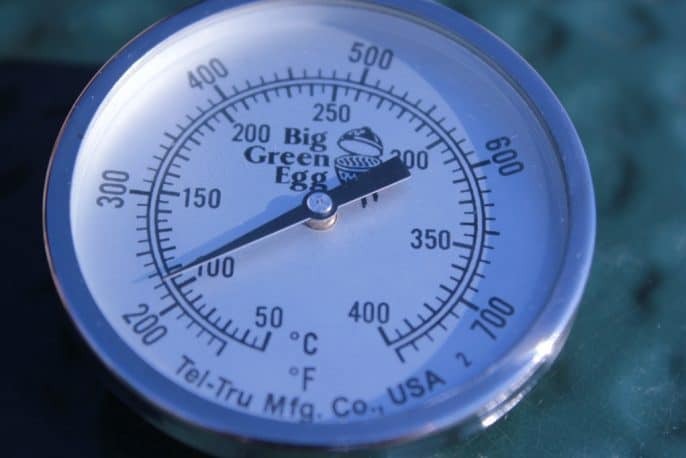 I have a Green Egg and I have gotten pretty good about controlling the temp at 225. But I have still not gotten really tender ribs. I have been using the plate setter, legs up, with a drip pan and the grill above for the entire cook. Of course a drip pan is not needed for the second 2 hours, but why remove it. So I have a complete indirect cook. Now I am thinking about trying the cook without the plate setter and the drip pan. What do you think? At 225 degrees, in the egg, I don’t think I will have flare ups, and I wonder if it would cause other problems. My friends seem to think they want “fall off the bone” tender. I don’t want to go that far, but I want more tender than I have been getting. 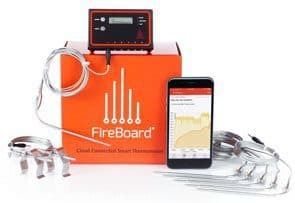 Would the direct cook at low temps help me? I tried the butter injected ribs this past weekend. I had trouble making the inject. The rub clumped in the bottom of the dish once in the melted bitter. Can you help. Tasted great, just unable to inject. You have to stir it a lot while you are using it. By adding a lot of rub to the butter, some of it doesn’t mix, but enough of it does to make a difference. Your injected spare ribs sound delicious, but I do have a question. When describing the 3-2-1 and 4-1-1 methods, you state that the 3-2-1 method is against competition rules. Why do you think this? 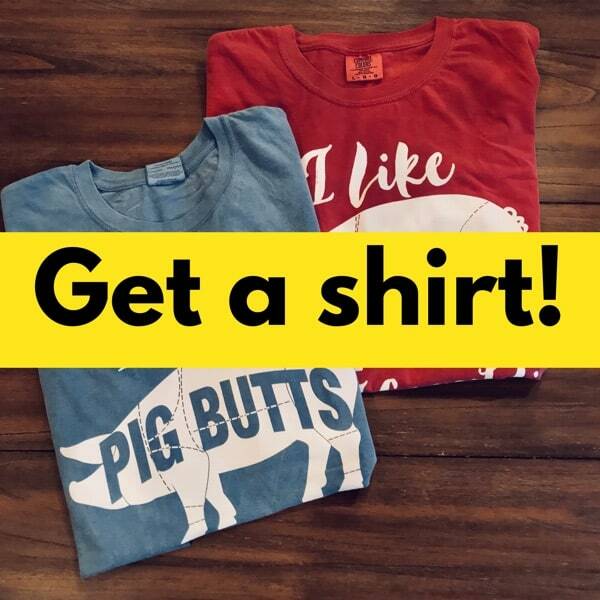 I’m a KCBS Certified Judge and can find nothing in the rules or judging guidelines to support this. Larry, the process itself is not against the rules, based on my limited knowledge of competition BBQ but, I am told that it does make the ribs too tender and they are then considered to be over done. It is entirely possible that the 4-1-1 would be fine. I am not a competition guy so I can’t speak from experience here. There’s no reason why the 3-2-1 or the 4-1-1 methods won’t produce competition quality or fall off the bone quality. As always, it’s simply a matter of adjusting your times to produce the results you want.